Poor Elijah. He really went through it, didn’t he? He was surrounded on all sides by non-believers. They were vigorous in their false faith and Elijah was vexed to the extreme. It’s really hard to be the only one in a place where you are the only one who knows the truth and proclaims it, yet no one else will listen. “And the word of the LORD came to him: “What are you doing here, Elijah?” He replied, “I have been very zealous for the LORD God Almighty. The Israelites have rejected your covenant, torn down your altars, and put your prophets to death with the sword. I am the only one left, and now they are trying to kill me too.” (1 Kings 19:9-10). Elijah was not a glorified man, nor a superhuman man. He was a regular person. And he had just gone through a debilitating and lengthy ordeal of fruitlessly trying speaking the Word of the LORD to the people, and they refused to hear. Then he went through an awful but glorious contest where the LORD manifested Himself to all. How would you react if the LORD manifested Himself in front of you? The reaction of the prophets and the apostles who see or hear God’s glory fall down as dead men. (Rev 1:17; Is 6:5; John 18:6; Acts 9:4; 1 Kings 18:39). Not only did Elijah live through a great and powerful manifestation of God’s glory, he had to then go and kill 450 people. Personally. “…Elijah brought them down to the Brook Kishon and executed them there.” (1 Kings 18:40b). The most highly decorated heroes of warfare in our own day receive commendations for having slain fewer of the enemy and most of those were not for hand to hand combat. By now Elijah hides in a cave, thinks he is the last believer and cries out the God that he is finished, he wants to die. I don’t blame him. So the man is tired, spiritually drained, afraid for his life, and alone. Or he thinks he is alone. The first thing God does is send an angel to comfort Elijah. (1 Kings 19:5). The angel gently touched Elijah’s shoulder, and refreshed him with food and drink. Elijah was not alone. The next thing that happened was the God spoke to Elijah. He told Elijah to listen, and there the LORD sent wind and rockslides and tumultuous earthquakes but He was not in the wind nor the rocks nor the tumult, He was in the still, small voice. (1 Kings 19:12). Elijah was not alone. God told Elijah that “I have reserved seven thousand in Israel, all whose knees have not bowed to Baal, and every mouth that has not kissed him.” (1 Kings 19:18.) Elijah was not alone. God told Elijah to go to a certain town and find Elisha and anoint him as prophet to succeed Elijah. Just as Elijah was growing weariest, God gave him light at the end of the tunnel, and showed him that his time of service was nearing an end. He needed to train Elisha, and then Elisha will take over “in your place.” (1 Kings 19:16b). He would have a helper for a while. Elijah was not alone. Best of all, Elijah knew to whom to cry out, and God answered. God was with Elijah. Elijah was not alone. 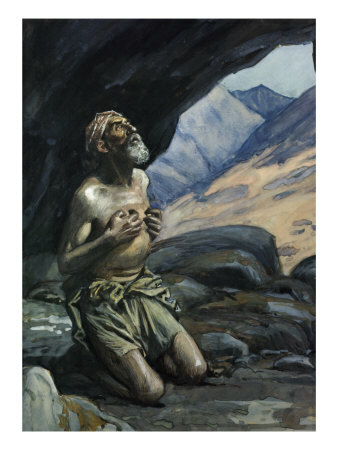 Elijah was blessed to have the LORD personally tell him he was not alone in his faith. But by that same token, because of its inclusion in the Bible, the Lord is telling us today that we are not alone. He sends His Spirit to us. He sends His unknown angels to us. He sends encouragers to us. He sends His Word to us. He sends hopeful doctrine to us so that we have light at the end of the tunnel, hope in the rapture of believers. We pray to Jesus and He hears us. We are never alone. We may feel as Elijah does, weary and dispirited in the service, with no one nearby who is like-minded. We may live in a town where there are no other Bible believing Christians within your field of vision, as Elijah had thought, but we belong to a body. That body extends worldwide, and we are part of it. We are not alone, not one of us. This essay first appeared in April, 2011. It’s been edited lightly.